Free & Open to the public. Member meet & greet begins at 7:00 pm. This is a talk on the more notable comets in the last several years, how they were discovered, and the technology required to discover them. It also briefly discusses the Large Synoptic Survey Telescope, the LSST, that once up and running, will undoubtedly be the comet-catching observatory for the world. It finishes up with a discussion of ‘Oumuamua and the intriguing questions it has left behind as it leaves our solar system. 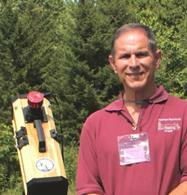 Steven Bellavia is an amateur astronomer and telescope maker. He is an aerospace engineer who worked for Grumman Aerospace with the Thermodynamics Group of the Space Division. He had a key role in developing a nuclear rocket engine and performed the analysis, design and fabrication of the micro-gravity liquid droplet radiator that flew on Space Shuttle mission STS-029. Steve has been at Brookhaven National Laboratory since 1992 and is the principal mechanical engineer on the camera sub-system for the Large Synoptic Survey Telescope. Prior to that, he was doing research and engineering for the Relativistic Heavy Ion Collider and the NASA Space Radiation Laboratory. Steve is also adjunct faculty at Suffolk County Community College for Physics, Engineering and Astronomy, and the Astronomy Education and Outreach Coordinator at the Custer Institute and Observatory in Southold, New York.